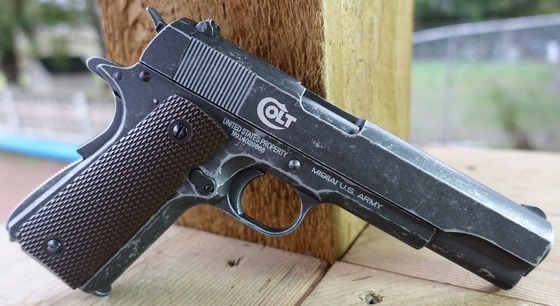 Model:Colt Combat Vet Limited Edition 1911. Materials: Pretty much all metal build. 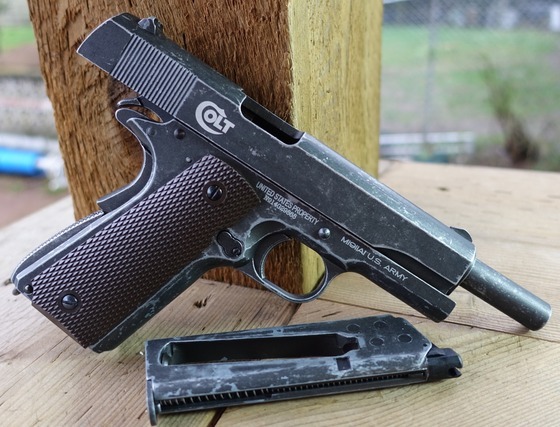 Trigger Pull: The trigger pull on the Umarex Colt Combat Vet Limited Edition 1911 is like all the other KWC made CO2 full blowback 1911's, it's exactly what you would expect form a real 1911 single action only pistol which helps to make this replica 1911 a great trainer. So in other words the trigger pull is super short, super light with very little take-up and a nice crisp break. Accuracy: I have not shot this "version" of the Umarex - KWC 4.5mm BB 1911 but it will undoubtedly perform exactly like all the others. I can expect decent under 2 inch groupings from 30 feet out and will get a little over 300 fps on a full CO2 cartridges. Depending on how fast I shoot off my magazines, I should expect to get around 3 good mags and if I slow things down a bit I should get a forth magazine so anywhere from 50-70 good or so shots per CO2 out of the Umarex Colt Combat Vet Limited Edition 1911. 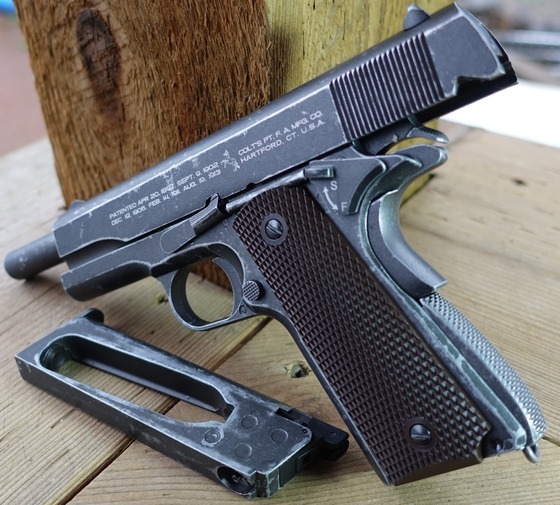 Build Quality: Very good, with almost all metal construction, good weight and craftsmanship, the KWC 1911 line of pistols have proven themselves over time and even though some of the original first run units had some CO2 valve issues, this seems to have been fixed over the years. 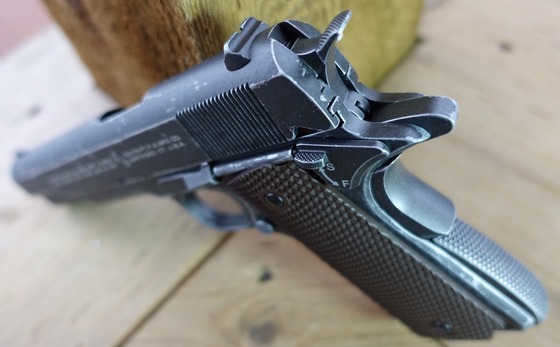 You will find most of these KWC pistols in general have a rather thin coating for a finish and so they tend to wear a bit on the high spots but with this weathered Umarex Colt Combat Vet Limited Edition 1911 that really isn't a concern! 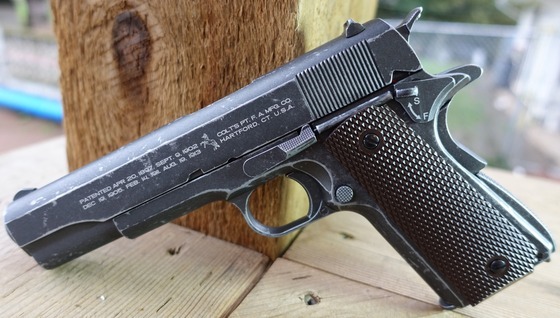 Realism: This is as close as you can come to the look, weight, feel, and action of the real 1911 in virtually almost every way including the ability to field strip this pistol! All the mechanical parts work just like they do on a real steel 1911 including the grip safety. I'm not sure what more you could ask for? The Umarex Colt Combat Vet Limited Edition 1911 even has that real gun wear and tear look to it which in my opinion even adds to the realism. 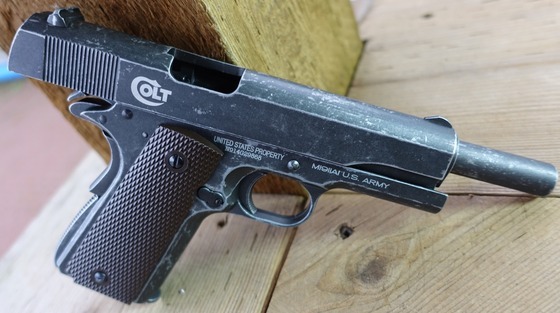 Extremely realistic airgun replica of an original Colt 1911 A1 styled 45 auto. Would make an excellent training gun as it functions just like the real steel 1911 45 handgun. Field strips just like the real 1911 45 auto. True 1911 Single action only trigger, excellent pull, very smooth and light. 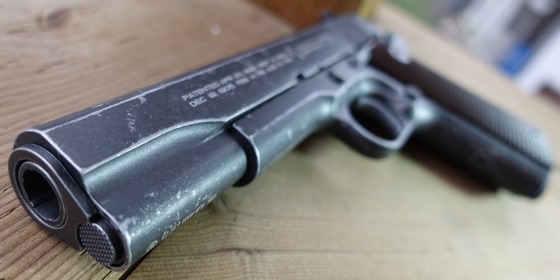 Weathering gives this pistol a very authentic look to it. Warning instructions are nicely out of the way. It goes through CO2 very fast as do all the KWC full blowback pistols. Umarex decided to label the safety, perhaps for legal reasons but it detracts from the finish. You would think by now I would be getting tired of reviewing yet another variation of the KWC made 1911? Nope! The Umarex Colt Combat Vet Limited Edition 1911 with it's Umarex Colt licensed and Weathered appearance adds just enough to respark my interest in these awesome CO2 Blowback 1911 replicas and every time I pick one up I get a little excited and want to go out and shoot some rounds through one :) If for some reason you have not picked up one of these 1911's to date then make sure to grab the Umarex Colt Combat Vet Limited Edition 1911 before they are all gone!